A List of Blockchain Jobs in India that You Should be Familiar With! Since bitcoins, and cryptocurrencies in general, had become illegal in India, there is widespread confusion regarding Blockchain among the public. Most of us are probably wondering whether is it safe and fruitful to do a course in Blockchain. Well, first of all, let me make it clear that the answer is yes! It is perfectly safe, fruitful, and advantageous to learn blockchain. And above all, there is no shortage of jobs too. The list is quite long where the subject of the availability of Blockchain jobs in India is concerned. However, it seems like you have a question or two that is eating your brain. So to begin with, we’ll start by answering them. And then we’ll get to our list of Blockchain jobs in India. Is Blockchain legal in India? Yes. Blockchain as a technology is very much legal and valid in India and as well as abroad. There has never been a ban or uncalled for discussion on Blockchain at all. Moreover, several government projects and various sectors make use of this blockchain technology. So what is Blockchain in the very first place? Blockchain Technology plays a big role in cryptography. This distributed ledger technology helps in recording the online monetary transactions between two parties in the most secured manner. These data are stored in small groups of records known as blocks. So, where did this confusion regarding Blockchain’s validity come from? Although Blockchain is legal, cryptocurrencies aren’t! Lack of proper public awareness on cryptocurrencies paved a way for several cyber crimes in India. As a result, Cryptocurrencies like Bitcoins became banned by the Indian Government. Blockchain was initially developed to make a secure record of Bitcoins transactions. Consequently, people started thinking that Blockchain’s sole role relies only on cryptocurrencies. However, that is only a misunderstanding. To explain it in short, while cryptocurrencies rely on Blockchain, Blockchain technology is not restricted to cryptocurrencies alone. Being said that, it is highly likely that cryptocurrencies will get back on track very soon. Assets and currencies are increasingly moving online; India is getting digitalized. Hence, it is only a matter of time before things fall into its places. So, the question is, what are the career options after doing a Blockchain course? Or to be more specific, what are the kinds of Blockchain jobs in India that you need to be aware of. Need the answers? Read our following List of Blockchain Jobs in India to know more. Doing a course in Blockchain technology or having a good amount of working experience in blockchain technology can help you find a lot of white collar jobs in India. The blockchain technology is one of the fastest growing skills around the world with about 6000 registered job vacancies that require skilled blockchain professionals and freshers. First of all, Blockchain is a relatively new area in India. On top of it, there is a surge in interest and rise in demand. And the interesting part is that Blockchain technology is a required skill in a number of jobs. So, if you own a certificate in Blockchain technology, you might as well take a look at the following list to find the job that suits you. However, if you don’t own the required skill, this would be the right time for you to do a course in Blockchain. 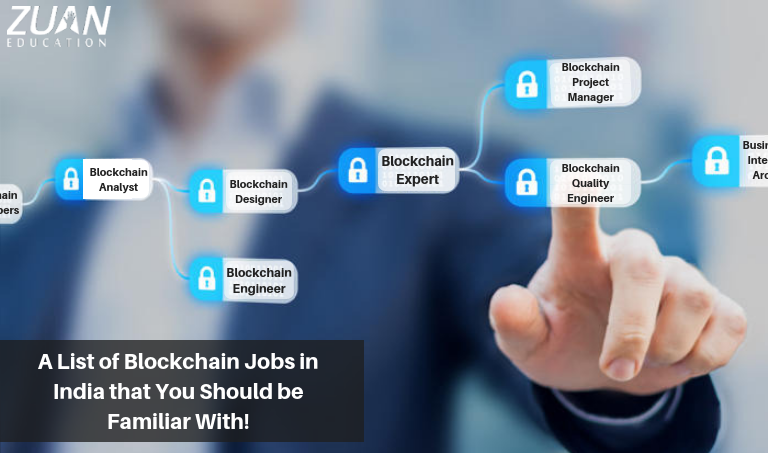 So, let us go and take a look at some of the topmost Blockchain jobs in India. Blockchain developers are high in demand. There are number of urgent openings for blockchain developers in India and abroad. A developer will basically develop and implement achitecture of Blockchain solutions that can run on the various blockchain platforms. A blockchain analyst will analyse business requirements, features, and functionality using the blockchain fundamentals, consensus algorithms, and smart contracts. Of course, a good analyst will know how to analyse various business entities using the blockchain technology. At the same time, he/she should be able to identify blockchain-based solutions to challenges within the business context. Blockchain designers seeks to design a user experience that is reliable and appealing to the user. As UI and the design is getting more important in the recent times, there is good demend for skilled blockchain designers. Being a blockchain designer, one has to research, design, develop, and test blockchain technologies in order to provide the user with good experience. A blockchain project manager understands the client’s specific business cases (where blockchain technology is concerned) and will rely on the requirements to blockchain experts. Project managers are responsible for planning and supervising the accomplishment of the blockchain project. In order to mediate between the company and the developers, managers should possess adequate knowledge in Blockchain and as well as communication skills. One of the key requirements in the job description would be the ability of the professoinal to make sense of blockchain and communicate to non-technical people in the organization to provide effective updates and get resourcing. A blockchain expert should be able to understand key blockchain and broader distributed Ledger technologies and trends. He/she should have expertise in the distributed ecosystem such as Ethereum, BTC, and IPFS. Of course, the expert has to be technically stron so that he/she can successfully develop the blockchain solution. Blockchain Engineers are responsible for designing, implementing blockchain apps that address the technical needs of the company. The blockchain engineer designs and develops smart-contract based blockchain applications to solve real business problems. He or she implements and accelerates digital assets and enable the company to use bitcoin and Ethereum. Blockchain Quality Engineer is responsible for the quality in the blockchain development environment. Rigorous testing and automation frameworks ensures that. Quality Engineers does research on blockchain tools and develop and implement quality assurance (QA) test automation standards and strategies. Business and Integration Architect works directly with the clients and their requirements. Here, blockchain technology is understood through business strategies and goals. The professional will drive the end to end Blockchain Request for Proposal (RFP) to arrive at estimations, clarifications, understandings and such to help recognise solution deals. He/she has to solve problems where blockchain engineering, designing, implementing, and supporting are concerned. It could be done by documenting the best practices and acting as small and middle-sized enterprises (SMEs). The legal consultant or attorney looks into the legal sides of cryptocurrency. He or she advises the organisation as to how to deal with the digital assets and administer primary coin offerings. Legal consultant has a greater role to play in India since cryptocurrencies face legal scepticism and objections. Technology lead works with Blockchain technology, encryption, or distributed peer-to-peer systems. He or she relates technical matters clearly and effectively to both technical and non-technical audiences, win supporters, and encourage people to action. Basically, the Technology Lead supervises technical teams comprising scientists, developers and business analysts. The overall Global blockchain market is expanding at an exceptional rate. It is anticipated to grow from USD 1.2 billion in 2018 to USD 23.3 billion by 2023. There are also several openings for blockchain professionals in India in various government and non-government organisations. Most of these organisations that we have heard of work while supporting distributed blockchain based network. So, with enough experience in the field or after doing a course in Blockchain, you can find jobs in healthcare, national security, law, energy, finance and several other areas. Blockchain jobs can let you earn a good salary. Opportunities are innumerable too. But, the question is, are you qualified to upgrade your lifestyle? If not, it is the right time for you to learn Blockchain.